These days, cooking dinner requires no more thought than turning a knob on a stovetop, but for early humans the notion that, simply by applying heat or fire, foods could be transformed into something both tastier and easier to digest demanded huge cognitive insight, insight often believed to be limited to humans. New evidence, however, suggests that, when it comes to cooking, humans may need to make more room at the table. A new study, co-authored by Dr. Felix Warneken, the John L. Loeb Associate Professor of the Social Sciences, and Dr. Alexandra Rosati, currently a post-doctoral fellow in the Psychology Department at Yale University who will join the Department of Human Evolutionary Biology as an Assistant Professor at Harvard this summer, suggests that humans' cognitive capacity for cooking is also shared by chimpanzees. This includes a preference for cooked food, the ability to understand the transformation of raw food into cooked food, and even the ability to save and transport food over distances for the purposes of cooking. The findings suggest that those abilities emerged early in human evolution, and that aside from control of fire, chimps may possess all the requisite cognitive skills to engage in cooking. The study was published online on June 3, 2015 in an open-access article in Proceedings of the Royal Society B. The article is titled “Cognitive Capacities for Cooking in Chimpanzees.” "It is an important question when cooking emerged in human evolution," Dr. Warneken said. "We thought one way to get at this question is to investigate whether chimpanzees, in principle, have the critical cognitive capacities for cooking. Can a routine hospital stay upset the balance of microbes in our bodies so much that it sets some older people up for a life-threatening health crisis called sepsis? A new University of Michigan (U-M) and Veterans Affairs Ann Arbor Center for Clinical Management Research study suggests this may indeed be the case. The study shows that older adults are three times more likely to develop sepsis -- a body-wide catastrophic response to infection -- in the first three months after leaving a hospital than at any other time. What's more, the risk of sepsis in that short post-hospital time is 30 percent higher for people whose original hospital stay involved care for any type of infection -- and 70 percent higher for those who had a gut infection caused by Clostridium difficile. In fact, one of every ten C. difficile survivors ends up with sepsis within three months of his or her hospital stay, according to the new study published online on May 27, 2015 in the American Journal of Respiratory and Critical Care Medicine. It's the first analysis of its kind. The article is titled “Hospitalization Type Predicts Risk of Subsequent Severe Sepsis.” The researchers chose to look at the relationship between hospitalization and sepsis because of a growing understanding that antibiotics and other infection treatments disrupt the body's microbiome -- the natural community of bacteria and other organisms that is vital for healthy body function. In turn, C. difficile preys upon hospital patients who have a disrupted gut microbiome. Sometimes even cells get tired. When the T cells of your immune system are forced to deal over time with cancer or a chronic infection such as HIV or hepatitis C, they can develop what is termed “T cell exhaustion,” becoming less effective and losing their ability to attack and destroy the invaders of the body. While the PD-1 protein (programmed cell death protein 1) pathway has long been implicated as a primary player in T cell exhaustion, a major question has been whether PD-1 actually causes exhaustion directly. A new paper from the laboratory of E. John Wherry (photo), Ph.D., a Professor of Microbiology and Director of the Institute for Immunology, in the Perelman School of Medicine at the University of Pennsylvania, seems to, at least partially, let PD-1 off the hook. The paper was published online on June 1, 2015 in the Journal of Experimental Medicine. The article is titled “Genetic Absence of PD-1 Promotes Accumulation of Terminally Differentiated Exhausted CD8+ T Cells.” In short-term infections such as a cold or flu, PD-1 helps to regulate an initial strong T cell response, preventing the T cells from over-proliferating and attacking the body's own cells after the infection has been cleared. But in patients with cancer or chronic infections, blocking PD-1 has proved a highly successful therapeutic strategy that allows the T cells to fight on. “Blocking this pathway reverses T cell exhaustion and improves tumor immunity in humans and anti-viral and anti-tumor responses in animal models,” Dr. Wherry notes. “But a key question has been whether this PD-1 pathway causes exhaustion. Our work shows that it does not.” Dr. Wherry and his collaborators used PD-1 knockout mice infected with lymphocytic choriomeningitis virus to see whether the genetic deletion of PD-1 would be enough to prevent T cell exhaustion. Malignant tumors of the oral cavity are the sixth leading cause of cancer-related deaths worldwide. As such, a fast and accurate diagnosis is key to maximizing the probability of successful treatment and the hope and quality of life of patients. Investigators from the Biomedical Research Institute (IBI), in Galicia, Spain, who form part of the BIOCAPS (Biomedical Capacities Support Programme) project, have patented a novel, faster, more reliable, and less invasive technique for detecting carcinomas in the oral mucosa. This patent has been licensed to the company Irida Ibérica, which is currently developing a portable prototype and will fund further research by the IBI scientists to establish the exact malignancy parameters by way of in vivo trials, in other words using tissues analyzed in patients. Scientific/clinical collaboration, which is one of the main objectives of BIOCAPS to ensure research results oriented towards resolving problems in medical practice, has formed a key part of this breakthrough. Thus, the New Materials Group at IBI and the Otorhinolaryngology Department at the Hospital Povisa (Vigo, Spain) worked together to develop this new technique, which could possibly be adapted for application in the diagnosis of other common cancers, such as cervical and skin cancer, in the future. “The earliest symptom of cancer of the oral cavity is the appearance of whitish or reddish lesions, which do not disappear or which may grow larger with time, on the inner surface of the oropharyngeal cavity,” explains Dr. Roberto Valdés from the Hospital Povisa. These lesions subsequently become painful, either spontaneously or during chewing or swallowing, followed by the onset of oral bleeding. Researchers have shown that a novel aptamer-based delivery strategy can efficiently introduce a functional microRNA (miRNA) that has anti-cancer and anti-angiogenic activities into two different types of cells—into breast cancer cells to inhibit tumor growth and metastasis, and into endothelial cells that line blood vessels to protect against atherosclerosis. The overexpression of miR-126 in such cells using a universal aptamer delivery approach is described in an article in the June 2015 issue of Nucleic Acid Therapeutics, a peer-reviewed journal from Mary Ann Liebert, Inc. publishers (http://www.liebertpub.com). The complete article is available free on the Nucleic Acid Therapeutics website until July 3, 2015 (see link below). Dr. Jan-H Rohde and Dr. Stefanie Dimmeler, Goethe University (Frankfurt, Germany) and Dr. Julia Weigand and Dr. Beatrix Suess, Technical University (Darmstadt, Germany), linked the short noncoding RNA miR-126, which is essential for the growth of blood vessels, to an aptamer, a short nucleic acid sequence that delivers the therapeutic microRNA inside target cells. The researchers describe how they formed an aptamer chimera by linking a precursor of miR-126 to an aptamer of the transferrin receptor, which is present on the surfaces of both normal endothelial cells and cancer cells. Data demonstrating the efficient uptake of the aptamer and the processing of the precursor miR-126 to produce a functionally active microRNA are presented in the article titled "A Universal Aptamer Chimera for the Delivery of Functional microRNA-126.” "This innovative strategy demonstrates for the first time an aptamer-based modular delivery of microRNA in endothelial and breast cancer cells," says Nucleic Acids Therapeutics Executive Editor Graham C.
If a banana is rotting in the fruit basket of your kitchen, the chances are that a fruit fly will find it long before you do. How is the nervous system of a tiny fly capable of following the odor trail created by a banana? This question has been addressed in a new study conducted by the Sensory Systems and Behavior laboratory led by Dr. Matthieu Louis at the EMBL-CRG Systems Biology Unit of the CRG (Centre for Genomic Regulation) in Barcelona, Spain. The fruit fly Drosophila melanogaster is an excellent model system in which to explore how complex behaviors, such as chemotaxis, are controlled by the activity of neural circuits. Although the word neuroscience may evoke the human brain to most of us, research in smaller genetic model organisms often represents the most direct entry point into the molecular and cellular basis of neural functions. The research carried out by the Louis lab is a new example of how the combination of interdisciplinary tools permits scientists to probe basic principles underlying complex biological processes. In this case, CRG scientists dive deeply into the fruit fly neural circuits, which could be the entrance to understanding more complex systems such as those in the human brain. The work was published in the June 1, 2015 issue of Current Biology. The article is titled “Role of the Subesophageal Zone in Sensorimotor Control of Orientation in Drosophila Larva.” To identify the neural circuits involved in chemotaxis, the research team decided to concentrate on the fruit fly larva, which comprises 10,000 neurons — 10 times fewer than adult flies and 10 million times fewer than humans. In demanding efforts, the team screened over 1,100 fly strains in which the function of a small subset of neurons in the brain could be genetically turned off. One of Australia's smallest birds has found a cunning way to protect its nest from predators by crying wolf, or rather “hawk,” and mimicking the warning calls of other birds. 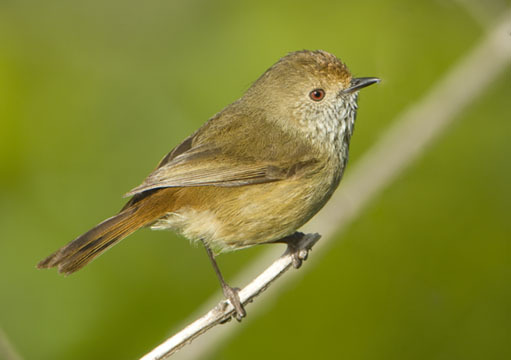 Researchers from The Australian National University (ANU) and the University of Cambridge (UK) found that the tiny 6-gram brown thornbill mimics the hawk warning calls of a variety of birds to scare off predators threatening its nest, such as the larger pied currawong. "It's not superbly accurate mimicry, but it's enough to fool the predator," said Dr. Branislav Igic, who carried out the study during his Ph.D. work at the ANU Research School of Biology. "A physical attack on a currawong would be no good. They are 40 times the size of a thornbill and will eat adults as well as nestlings.” "I am amazed that such a tiny bird can mimic so many species, some much bigger than itself. It's very cunning," said Dr. Igic, who has now taken up a position at the University of Akron, in Ohio, in the United States. This research was published The research, conducted by scientists was published online on June 3, 2015 in the journal Proceedings of the Royal Society B. The article is titled “Crying Wolf to a Predator: Deceptive Vocal Mimicry by a Bird Protecting Young.” Although vocal mimicry is widespread amongst birds, its function is rarely understood. This study is the first to show that birds use vocal mimicry to scare predators. The researchers stumbled across the thornbill's deceit during an experiment on birds' reactions to a stuffed owl, said Professor Robert Magrath, the leader of the research group at the Research School of Biology. "I was puzzled because I could hear the alarm calls of robins, honeyeaters, and rosellas, but I couldn't see any," he said.